The Butterfly Summer - Harriet Evans - So many books, such little time. Nina lives with her parents now that she is divorced from her husband Sebastian. Nina's childhood wasn't all that easy with her father leaving her and her mother back in 1986, when he 'went on an expedition to the Venezuelan rainforest to search for the Glasswinged butterfly and he never came back'; Nina was only six months old. Nina's mother, being on her own to raise a child, found a very nice and important person to help her out, Mrs Poll from the top floor until her partner, Malcolm, came along. Many years later, Nina meets a strange lady at the library, her 'dead' father returns and claims that Nina will inherit Keepsake, a cottage in the middle of nowhere in Cornwall where millions of butterflies find sanctuary but in the house itself, her ancestors lives have been taken. The story seems to take the route of a murder mystery but I can assure it isn't. This was a rather interesting and enjoyable read although when the story took me back to Theodora Parr's 'The Butterfly Summer', I found that it dragged on for too long and when it went back to the original story, I forgot what happened previously and would get the two time differences mixed up. Because of this I'm only giving it two stars as half-way through it felt like a chore reading this. 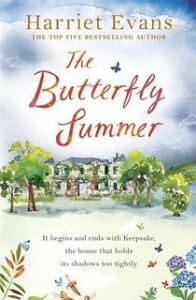 I received a copy of 'The Butterfly Summer' from the Goodreads Giveaway.